Hasta Siempre, Dear Comandante Fidel! The Revolutionary of all Revolutionaries, El Comandante Fidel Castro, died on 25 November 2016, at the age of 90 (1926-2016). But the spirit of his Revolution will live on forever. Fidel, the Leader of the Cuban Revolution, is an icon not only for Cuban history, but for the world. He has for almost 60 years defied the power of the United States, of 11 US Presidents. He has resisted a brutal, illegal and criminal international blockade against his small Caribbean island of 11 million people. As one of his devotees exclaimed, before Fidel, Cuba was apebble in the Caribbean; today, Cuba is known in the entire world. Fidel survived more than 600 assassination attempts by US secret services, their mercenaries and proxies. 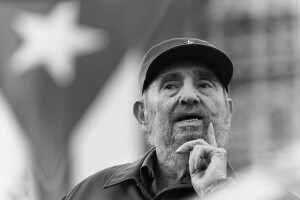 In 2008 he stepped down for health reasons, appointing his brother Raúl, who was his co-revolutionary in 1959 and throughout the last six decades, to continue leading the Revolution forward with the socialist values that brought Cubans universal health care, education and other social indicators, unmatched anywhere in the Americas and in most of the rest of the world. One of Fidel’s and his team’s most important achievements – and example to the world – is Cuba’s resistance to the US imposed total ‘bloqueo’, as the Cubans call it. It has become a work in progress of an ‘Economy of Resistance’ and may become an example for many countries unwilling to bend to the neoliberal dictate of the Occident. After the 1959 overthrow of the US backed dictator, Fulgencio Batista, the US blockade was first imposed by President Eisenhower in October 1960, covering all US exports except for food and medicine. In its eternal spirit of manipulating the truth, Washington likes to use the softer term ‘embargo’, instead of what it was and is: a blockade. In 1961 just before leaving office, Eisenhower broke off all diplomatic relations with Cuba, in an effort of total isolation of the island nation. In 1962 JFK expanded the blockade covering all trade. He also banned all travel by US citizens to Cuba. Despite President Obama’s recent ‘ouverture’ of reestablishing diplomatic relations with Cuba, the blockade remains practically unchanged. In his famous speech at the White House Cabinet Room on December 17, 2014, announcing Washington’s new approach to Cuba, Obama said, “After all, these 50 years have shown that isolation has not worked. It’s time for a new approach” – essentially meaning, we will try another method to bring about ‘regime change’. The blockade is as of this day governed by six US statutes, most prominently the Trading with the Enemy Act of 1917, and the Foreign Assistance Act of 1961. Referring to these laws, Obama said on 17 December “The embargo that’s been imposed for decades is now codified in legislation. As these changes unfold, I look forward to engaging Congress in an honest and serious debate about lifting the embargo.” And later in his speech, “In that spirit, we should not allow U.S. sanctions to add to the burden of Cuban citizens that we seek to help.” What a hypocrisy! With this US special legislation, and totally illegal, Washington has pressured the international community under threat of sanctions, to adhere to the US blockade and refrain from trading with Cuba. “though this policy [of isolation] has been rooted in the best of intentions, no other nation joins us in imposing these sanctions, and it has had little effect beyond providing the Cuban government with a rationale for restrictions on its people”. What a blatant lie! – Just witness on how Cuba’s economy has been down-beaten and curtailed as a direct and purposeful result of the blockade. But the Comandante and his people defied the worst: Cuba did not fall. Cuba stands tall as of this day – and will not fall to the pressures of the empire and its neo-fascist vassals around the world. Already in school Fidel learned about social injustice and was determined to fight against it, by becoming a lawyer. With the intention to overthrow the dictatorship of Fulgencio Batista, he created a guerilla organization, ‘The Movement’, renamed in 1955, “The 26th of July Movement” (‘Movimiento Revolucionario del 26 de Julio’ – ‘MR-26-7’), with which he carried out the liberation of Cuba that lasted from 1953 to 1959. In July 1953, Fidel and his comrades attacked the “Moncada” military barracks in Santiago de Cuba at eastern tip of the island. The assault failed. Many of Fidel’s Comrades lost their lives. Fidel was condemned to 15 years in prison. On 16 October 1953, in a 4-hour speech of self-defense to the court he spoke the by now legendary words, “History will absolve me” (‘La historia me absolverá’). And absolve him it did. In 1955, Batista declared an amnesty and Fidel was freed. He fled to Mexico, where he met with Argentine Marxist Revolutionary, Ernesto (Ché) Guevara – El Ché. Together and with his brother Raúl, and another 79 revolutionaries they embarked in November 1956 with the yacht ‘Granma’ on a 7-day journey to Cuba. They aimed for the mountainous Sierra Maestra, in Oriente Province. Under attack from Batista’s troops, only 16 comrades survived. They were able to recruit for the MR-26-7 a small guerilla army of 200 to 300 likeminded rebels. It grew as the Revolution grew and gradually took over the country. During two years, they battled the Batista military. On 8 January 1959, Fidel and his victorious guerilla Revolutionaries entered Havana. ‘Revolution knows no rest’, as Fidel said on several occasions. On 17 April 1961, Comandante Castro’s Revolutionary Armed Forces successfully defeated in a three-day battle the CIA sponsored Bay of Pigs invasion by the infamous Brigade 2506 – la invasión de la Playa Girón. This perhaps best known attempt to overthrow the Castro regime was followed by many more. Fidel defied 637 assassination attempts. He developed one of the world’s best and most effective secret and protective services. Fidel and Ché Guevara remained close friends and brothers-in-arms. El Ché held various government positions, including Minister of Industry. As traveling diplomat, he went before the United Nations in New York, attempting to reach a peaceful settlement with the United States; it failed. As a military strategist, he was instrumental in training Cuba’s Revolutionary Army that beat the Bay of Pigs invasion. He also played a major role in bringing the Soviet ballistic nuclear missiles to Cuba, prompting the 1962 Cuban Missile Crisis. Fidel led a Revolution that freed Cuba from 500 years of abject colonialism, first by Spain, then by the United States. But the Revolution didn’t end with the many victorious battles. Fidel and his comrades, and eventually the entire country became a living Revolution. In fact, Revolution became one of Cuba’s key export products. Revolution as a new way of thinking, Revolution as opposition to the all-destructive capitalism, Revolution as in Solidarity with people in need. When Hugo Chavez became President of Venezuela in 1999, Fidel and Hugo became friends and established a close relationship between the two socialist countries. In December 2004, Chavez and Castro founded the Bolivarian Alliance for the Peoples of Our America (ALBA), an economically sustainable alternative to the neoliberal, all-privatizing ‘free trade’ imposed by Washington throughout the 1990s on Latin America. It is an approach to trade where partners benefit equally, trading according to their necessities and maintaining their sovereignty. Cuba’s solidarity with nations in distress is unparalleled throughout the globe. Cuba’s medical doctors and workers are found in over 40 countries in the world, fighting epidemics, tropical diseases and helping with natural disasters wherever the need occurs. Cuban doctors were among the first ones in 2013 to fight the deadly Ebola disease in West Africa. When the devastating earthquake hit Haiti in 2010, Cuban doctors and emergency workers were the first ones to come to rescue. The Cuban Revolution travels by spirit, in the form of new mindsets. It had a huge influence on Latin American nations ‘turning gradually away from the northern imposed military dictators, freeing themselves from the fangs of the Northern Bald Eagle, alias, the ruthless all-devouring vulture. The Cuban Revolution was and is alive, a true sign for achieving the impossible with a revolutionary spirit. Fidel was a Don Quijote, always fighting for the oppressed, the dispossessed, those aggressed by the domineering forces of the west for their resources, for their strategically placed territories – or for sheer hegemony. Fidel never was a patsy to anyone. And this is maybe one of the most valuable lessons and messages he sends to the growing generation of young people who are unwilling to follow the path of the hegemon: Stand up for yourself, for the values you believe in, and in solidarity with the people who need your help. Your soul and conscience will reward you. Fidel’s legacy is larger than life, and larger than words can tell. Fidel is revered throughout the world, by statesman from the Americas, to Africa, to Asia. On 29 November, Havana’s Revolution Square will be replete with millions of mourners, including heads of states from all over the globe who come to bid farewell to Fidel, but foremost to celebrate his Revolution that will reverberate throughout the world in a life-force that can never be erased.